As a little girl, I was known to frequently make this rather bold (and no doubt equally annoying) proclamation. There was nothing in my life, I proudly declared, that I didn't remember. This drove my older brother, ever pragmatic, a little bonkers. "You can't remember everything," he'd tell me. "It's impossible." My mother once tried to ease his frustrations by reminding him of the fact that I was only five years old. Not much had happened to me in my life yet. I didn't have all that much to remember. Memory loss, particularly in terms of short-term memory, is one of the many symptoms those with myalgic encephalomyelitis often experience. Fortunately, it's not one of the symptoms that has thus far plagued me. Despite suffering severely from other cognitive difficulties as a result of ME, my memory remains strong. Sometimes I can't help but wonder if part of the reason I can still recall so much from my past is the same reason suggested to me as to why I could recall so much from my childhood. That is, very little has happened to me in the last many years. While my friends and family have gone on with their lives, experiencing a variety of new and exciting things, my own life has essentially remained stagnant. As a result, I am forced to spend much more time in my memories than others typically do. A few months ago, I listened to the audio version of Roger Ebert's moving memoir, Life Itself. As most know, Ebert lost his ability to eat and speak after the return of his cancer required surgery to remove his jaw. For a time, he was confined to his bed, unable to communicate. He writes, "In the days of my illness, unable to walk, I started to walk around London in my mind. ...I had nothing to do but lie in bed with my memories." In these years after my illness, when I can no longer speak and am set aside from the daily flow, I live more in my memory and discover that a great many things are safely stored away. It all seems still to be in there somewhere. …You find a moment from your past, undisturbed ever since, still vivid, surprising you. I, too, can sometimes get lost in memories. I close my eyes and I am seven years old again, riding my bike with neighborhood friends to the local convenient store, where we purchase a chocolate bar or ice cream treat for 25 cents each. I can still see the colorful display of candy and treats, momentarily overwhelming me with all the possible choices. Sometimes, I close my eyes and find myself returning to Boston, walking through the quaint and cobblestone streets of Beacon Hill, then down through the gardens and past the swan boats of the Commons, and finally over to Newbury Street, which always comes alive at nightfall. Later, I am back in London. Then Paris. Venice. San Fransisco. New Orleans. Disney World. The beaches of Hawaii. Or any number of the many places I was fortunate enough to travel to when I was healthy. Often, I relive the smaller moments of life too. I close my eyes and I remember what it was like to wake up and freely move from my bed. To take a shower, walk to the kitchen, cut up some fruit and make myself a simple bowl of cereal. I close my eyes and I am anywhere in past time, living life as a healthy person again. This is not to say I live in my memories, of course. It's only to say that I am grateful for them. I got sick when I was very young -- just a few years out of college. But I am lucky that I had so many adventures and experiences in those 24 years that I can now reflect back upon and relive in my mind. Some people with this illness aren't so fortunate in that regard. I think of other sufferers like Emily Collingridge, who first fell ill with ME when she was just six years old. She spent virtually her entire life sick, and for much of that time, Emily was fully housebound and, eventually, completely confined to her bed. Just try to imagine that for a moment, especially if you are someone who has been blessed enough to have a life free of disease. Imagine what it would be like to get sick as a very small child, so that almost all of your memories from your past are of being horribly ill. Emily, who died from complications related to her illness when she was just 30 years old, likely had very few recollections of what it was like to be healthy. And then there are those like my fiance, who developed ME at the age of 19, and who actually does experience the symptom of memory loss. While it's primarily the short-term that Jim struggles to recall, his long-term memory is also affected. He often expresses frustration at not being able to remember many details of the few years he spent growing up in France. Or of his time in high school, or college, or getting his PhD. He remembers the core of his life, of course, but the memories are fragmented, with large gaps in between. Memories are an integral part of how we define ourselves. They are a scattering of our most precious and important moments that, strung together, create within us a story we can then tell each other about who we are. I can't imagine what I'd do if I didn't have those memories to look back upon and remind me of who I was when I was healthy. They provide me not just with glimpses of what once was, but of what may someday be again. And so I close my eyes once more, and I choose a memory. Today, I return to the Grand Canyon and try to remember what it was like to stand at the edge of something so majestic. In doing so, my memory also becomes my wish. Someday, I hope, I will again be standing at the edge of something remarkable, and I'll no longer have such a need to look back. I have not posted to my blog in quite some time. Primarily, this is because I haven't felt well enough to put my thoughts together in any kind of formal, unified manner. But it's also in part because, being bedridden, not much happens in my life that feels all that worthy of noting. I wake up each morning, I check my e-mail, I eat some food, I look out the window, listen to some audiobooks or the radio when able, then -- exhausted from this minimal activity -- I am forced to go back to sleep. Day in and out, year after year. Occasionally, though, things do break from the norm. This past winter, for example, I woke up one morning to a rare dusting of snow on the ground. As a native New Englander, this would hardly seem worth mentioning. However, having lived in Arizona for 15 years now, the sight of snow accumulated on the ground (versus merely gracing the tops of mountains) feels like some sort of magical event. Thus far, I've only seen it happen twice. Of course, this being a desert, the snow had completely melted within a few hours of morning sunlight. In other news, this past March, Jim and I celebrated our 10th anniversary. He sent me a beautiful bouquet filled with 10 unique flowers to represent each year. It was incredibly sweet and thoughtful of him, as always. Our relationship continues to be long distant as a result of our health, but it remains as strong and rewarding as ever. In April, my brother and his family came out to visit. I got to see them for the first time in two years. As with their last visit, my health only permitted me to spend a few minutes with them each morning. It was just enough time for me to enjoy seeing their smiles every day, give them a hug and tell them I love them. As much as I yearned to spend more time with them, I was grateful for every moment we were able to share. I also loved to hear about some of their adventures as they visited various tourist sites in the area. 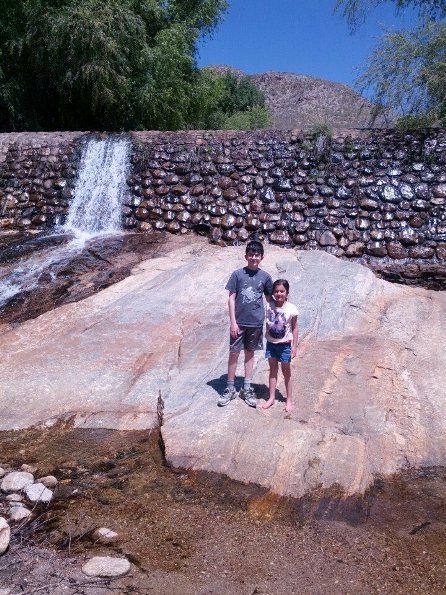 Here's a photo of my adorable niece and nephew at Sabino Canyon, which was one of my favorite places to visit back in my healthier days (photo courtesy of my brother). When you have severe ME (or, for that matter, even mild to moderate ME), life becomes all about the small accomplishments and the rare but sweet moments of slight reprieve. Perhaps that's why, when I got to move from a bed and lie outside for the first time in over two and a half years, it felt so amazing and utterly liberating to me. This was the first occasion in almost three years that I really felt well enough to even consider lying out. It also helped that we seem to have found a way to make it a bit easier for me, eliminating the need for a ramp. My parents move the lounge chair right up to the sliding glass door, so that all I have to do once they wheel me to it is plop down from my wheelchair. Getting back up is a bigger challenge, but thus far, I seemed to manage it without too huge a setback. It's one thing to see a small patch of sky from your window every day, but it's another to have it right above you. I tried to soak it all in as best I could. Spring is such a beautiful time of year here, with all the colorful cactus blooms brightening up the desert. Everywhere I looked, I saw tiny splashes of pink, yellow, red, white and orange. I also loved seeing all the tree branches gently swaying in the wind as all sorts of different birds sang their pretty songs. It was almost like watching nature put on some sort of graceful ballet. My own bedroom window continues to allow me momentary glimpses of other lovely sights as well. On one recent Sunday morning, two deer showed up and decided to lie out under the shade of one of our mesquite trees for well over an hour. They were beautiful. Apparently, much like cattle, deer will lie down in a secluded place to chew and digest their food. I was glad they chose a spot so close to my window where I could watch and admire them. And that about sums up some of the basic highlights of the last six months of my life. There were plenty of negative highlights as well, of course, but I'm choosing not to focus on those for now, as there's no sense in reliving them in any detail. The repeated setbacks and crashes that inevitably come with this disease often can be so brutal, persistent and difficult to put into words that, as soon as they lift even slightly, one doesn't want to look back. Overall, my health remains the same. I am still mostly bedridden and unable to speak much more than a few words above a whisper. I still can't stand, walk, read, take baths, watch TV or fully care for myself. However, thanks to small victories and a sprinkle of precious moments like the ones above, I also still have hope.